In 2013, I tried, if somewhat half-heartedly, to convince Matt that we should move into a "tiny house." I love them. Their simplicity and the prospect of extreme downsizing appeals to me. He rolled his eyes, of course, but, actually, I wasn't completely kidding. I really do like the idea of downsizing, if only to rid ourselves of the clutter on which we've wasted more money than I could bring myself to count. I like the idea of cozy little spaces and, according to The Tiny Life, these little houses are 100-400 sq. ft. That appeals to me. But then I realized that we just about already do. 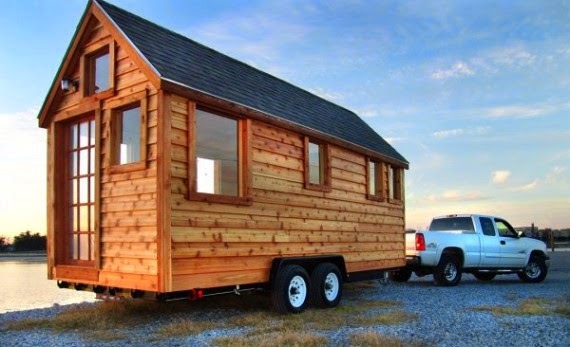 Do we live in a tiny house? No. But we do manage to squeeze ourselves, our furbabies, and our clutter into about 900 sq. ft., which isn't much. And yes, I realize that that's a pretty good amount of space for two people (twice the biggest "tiny house"), but we have so much crap that our space has been taken over by things. I counted the other day and we have 9 pieces of heavy furniture in our teensy tiny little living room. We're talking about 14' x 15'. Tiny. An issue of space compounded by the fact that every single surface in our house, every single one, is literally covered in stuff. The clutter is driving me nuts. For a while we had a 9-cubby bookcase and that helped, but Matt broke it (long, miserable story). So, in lieu of downsizing and throwing everything away, ditching our current space for a tiny house (of which Matt pretty loudly objects), I've decided that we're getting better organized in 2014. Which means shelving, because we don't have nearly enough. So, tonight, I ordered four shelving units. Two bookcases for the living room and two wire shelving units for the laundry room. Hopefully that will be a good enough start that I'm not staring at crap everywhere. Because the books that've swallowed up my kitchen table are driving me crazy--we have an open concept floor plan, so our kitchen and living room are open to one another. The shelving units are set to arrive sometimes between Jan 17th and 20th, so next weekend. Luckily, Matt's off and can help me put them all together--if he will. He's gotten to be quite handy since he started at his current job nearly two years ago. I'm not sure what will happen after I get all this shelving installed, but it'll be easier to assess what we need when we've started to get things better organized. I'm thinking it might be time to start throwing things away, not an easy feat for two pack-rats. When I want to toss something, he doesn't, and vice versa. Wish us luck... we're going to need it!